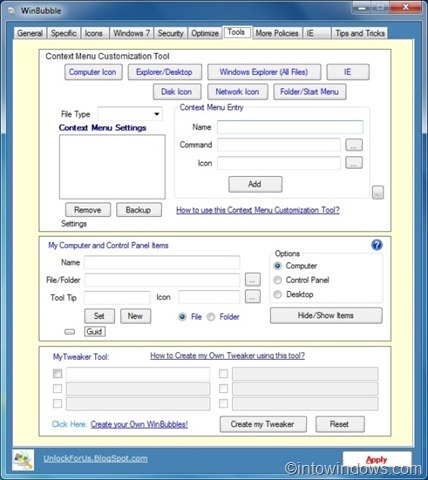 Early adopters of Windows Vista may have heard about WinBubble tool as it was one of the best free tools available for Vista. We have already blogged about WinBubble 1.0 for Vista. WinBubble tool has recently been updated to version 2.0 with loads of features to tweak and customize Windows 7. The latest version, WinBubble 2.0 comes with all the features and tweaks that you actually like to see in a good Windows tweaking tool. 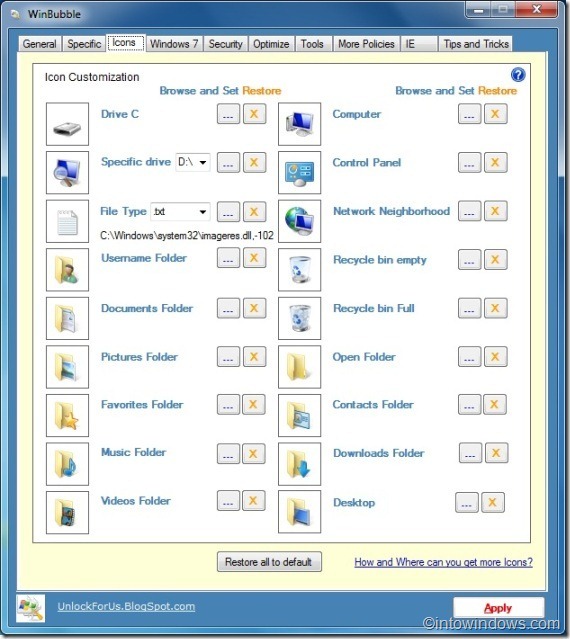 Along with hundreds of Windows tweaks, the latest version allows you change your folder, drive and desktop icons in a jiffy. 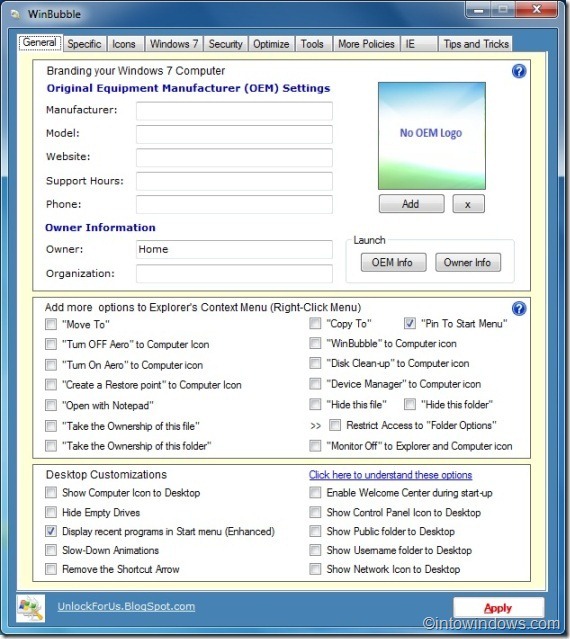 The tool also comes with Windows 7 logon screen customization tool to change your logon screen with shadow effects. 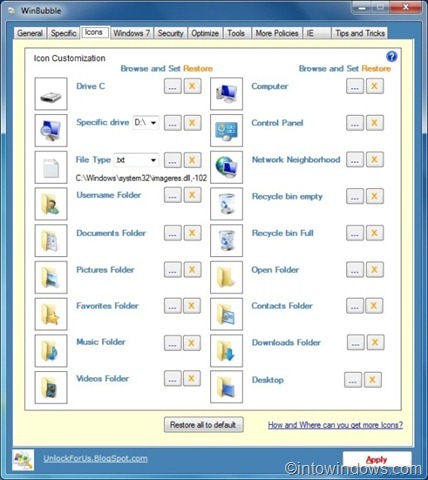 On top of that, you can access over 30 hidden Windows tools right from WinBubble. 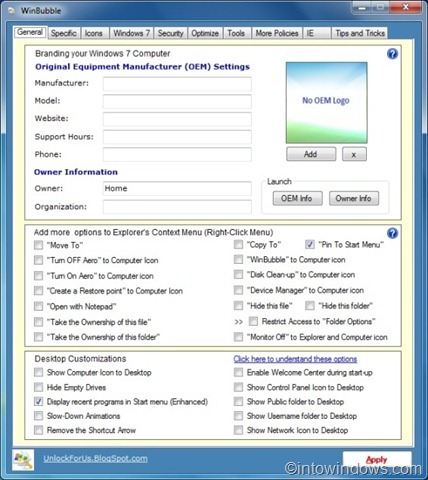 Other than that, it allows you personalize context menu (right-click) with a few clicks. You can add new entries to Computer Icon (My Computer) & Explorer right-click menus. Finally, it also contains some nice tweaks for your Internet Explorer browser. Overall it’s a good all-in-one tweaker for Windows 7.